MORINGA ORGANIC POWDER: Moringa powder is made by grinding the dehydrated Moringa leaves. Moringa leaves are the most nutrient rich parts of the Moringa plant. 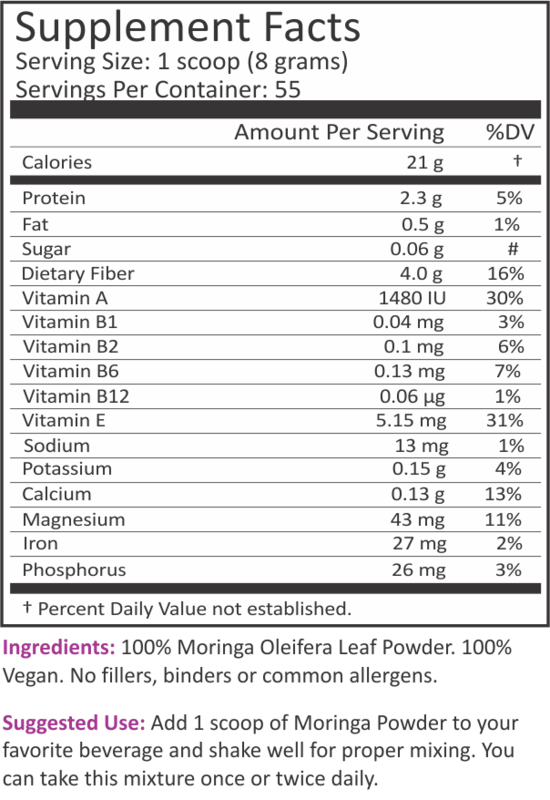 Moringa leaf powder contains 90 nutrients and 46 antioxidants. Moringa leaf powder is one of the richest source of natural Iron and calcium. Moringa powder is considered a natural multivitamin supplement. We offer 100% pure and organic Moringa leaf Powder. Fresh Moringa leaves are collected from the Moringa tree. And it is dried in a low temperature. The dried Moringa leaves are grind into Powder form. The Moringa Leaf Powder is used in a wide range of products from the dietary supplements to the smoothie mixes. The Moringa leaves are carefully washed; shadow dried under suitable atmospheric conditions and then powdered. Heat is not applied in any stage of the processing and thus the nutrient values of the leaf are retained.We supply the original Moringa leaf Powder in bulk quantity.